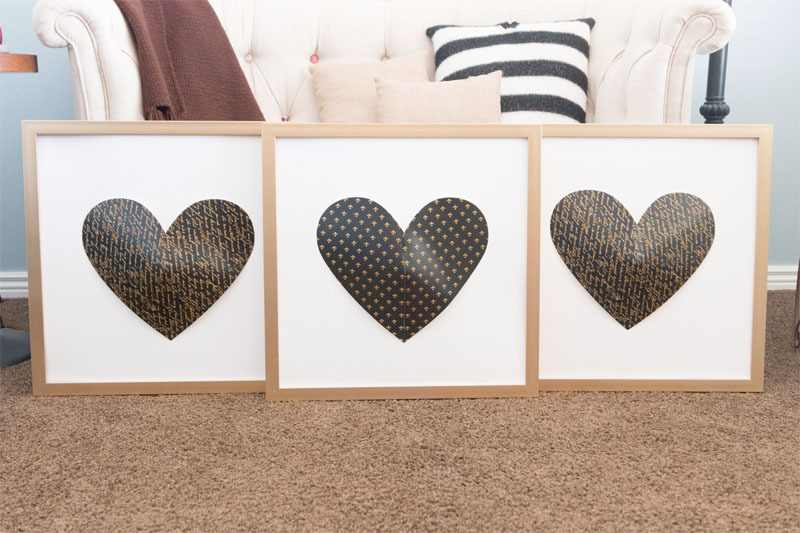 Whether you want to create a new home décor theme in your house or add to your current setup, the framed heart piece is a must-have. It can be put together in minutes and last for months. Trace and cut the heart template onto the back of 3 prints from the stack. Cut them out. Beginning with the first piece, slide one edge of the slit over the other side of the slit, keeping the heart shape but adding a slight pucker in the middle. Adhere the pieces in place. Repeat with the other 2 hearts. Adhere a heart to the center of each framed piece of watercolor paper (or cardstock) using dimensional foam squares to hold the hearts in place. Change out the paper to a different print or solid to create desired look. If no dimension is desired, leave the heart as is, cutting out step 2.